One of the great debates in HR circles is over what is strategic and what is merely administrative with respect to human resource management (HRM) processes. That which is strategic, often referred to as talent management, is considered worthy of executive attention, academic research, attendance at expensive conferences, and the writing of numerous articles. That which is merely administrative is beneath the attention of senior management except when cutting costs or, heaven forbid, when something goes wrong. And all of this discussion goes on without a rigorous or consistent definition of either strategic or administration HRM, let alone explaining their many interconnections or why we should care. Better day-to-day coaching, mentoring, assignment, development and career planning, and performance management. 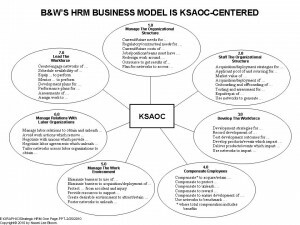 Not surprisingly, KSAOCs are at the heart of strategic HRM – finding them, acquiring them, motivating them, developing them, removing barriers to unleashing them etc. – and KSAOCs must be at the heart of your HRM processes and data if you’re trying to do anything strategic about HRM. What should also be clear is the interconnectedness between these strategic HRM processes and the bedrock, system of record objects on which they are totally dependent, including JOB, POSITION, WORK UNIT, WORK LOCATION, TOTAL COMPENSATION PLAN, the PERSON object hierarchy, and the list goes on. The larger the swath of strategic HRM that you’re trying to implement, to technology-enable, in order to accomplish needed business outcomes, the more inextricably entertwined are these strategic processes with the structural, often administrative underpinnings upon which they depend. For example, recording the termination of an employee is clearly administrative record-keeping, but determining which managers are having disproportionately high turnover, when other variables are accounted for, is very important information for driving the design of supervisory and manager developmental programs. Keeping track of employee eligibility and enrollment in various health and welfare benefit plans is certainly an administrative responsibility, but determining to what extent the design of these same plans is enabling or working against our retention of top performers is essential to managing organizational performance. In fact, we can find strategic data connections inside nearly all our humble administrative transactions, and therein lies a very real challenge for the design of your HRM delivery system. Another really good example, and one which is so familiar as to lull us into a false sense of security, is managing headcount. It’s on the backs of such administrative transactions as hires, terminations, promotions, and transfers that headcount reports are made. But what’s really important about headcount management is to understand what KSAOCs are coming and going through the organization. Are we losing critical KSAOCs at twice the rate at which we’re replacing them? Are the confirmed deadwood staying even as our best and brightest walk out the door? Are offers made but not yet accepted turning into offers never accepted for reasons that could be avoided? And why are some managers’ staff self-identifying for every posted opportunity? Is it a rush to get away from said managers or that those managers are encouraging career development at their own expense? So many questions whose answers depend on having the data surrounding those administrative transactions designed to support these more strategic questions. Whether you’re evaluating HRM software for in-house implementation or evaluating the HRM delivery systems of HRM BPO providers, you won’t get strategic HRM support unless your vendor or provider has a KSAOC-centered platform. Figure 1 above (click to enlarge) provides a collection of “killer” scenarios for determining to what extent your HRM software vendor’s products or HRM BPO provider’s platform provide a KSAOC-centric approach to all of the covered/in-scope HRM processes. For each of the seven highest level HRM processes, the phrases shown in Figure 1 are examples of what goes on in those processes that can only be completed by having an agreed upon vocabulary for KSAOCs with which to replace the “…”. Furthermore, the relationships among these highest level processes are all about KSAOCs – organizing the work around them, attracting a workforce which has them, developing them in the workforce, incenting their use via total compensation plan design, creating an environment which is conducive to their use, focusing relationships with labor organizations to obtain them, and leading the workforce every day to deploy them, to name just a few. Now that the connection between KSAOCs and strategic HRM is clear, let’s NOT lose this connection through the short-sighted use of HRM software silos, whether your own or those of a BPO provider. And don’t let the design and automation, again whether your own or those of a BPO provider, of those administrative processes hobble your ability to achieve the important business results that only strategic HRM can produce. When we owned the entire HRM delivery system, we only had to negotiate with ourselves, which was hard enough to do, when we realized that we had failed to design the initial data, processes and transactions to serve more than an administrative purpose. But when we have outsourced a good chunk of that HRM delivery system, we have to negotiate with our outsourcing provider(s) to redo those early data, process and transaction designs in order to achieve our HRM business outcomes. Of course, if we never defined those business outcomes in the first place, or if we failed to link those outcomes to the needed HRM delivery system capabilities, then we don’t even know what strategic HRM processes are needed, let alone by what metrics we would measure their delivery. If we’ve never made the journey down the Yellow Brick Road, shame on us!